Extra Goody #5 - "Vintage Mildred Halloween Greetings!" I have been neglecting Mildred mercilessly for months on end once again - for lack of time! The other elements of my day to day life just keep getting in the way, and this Halloween is no exception. But I thought it might at least be kinda fun to see some early Mildred art. Better than nothing, right? So here's one of her Halloween cards from early on. The original line art is from 2006, and the color is a slight 2008-revamping of the original 2006 color. ...And by that I mean a grand piano! There will be no grand piano, nor even any piano at all, but rather a mere keyboard, provided by Asphalt for the Let's Misbehave party on the 22nd after all, and Miss Erna Aloisia Pachulke has decided that under these conditions it would be better to stick strictly to her bilingual split-personality MC-ing and save the songs that she and Lola la Voix have been working on together for performance at some later date. Lola la Voix will be at the party anyway of course, in the audience, enjoying performances by Mama Ulita and The Queensgang Orchestra ect, and looking forward to future appearances with Miss Erna Aloisia Pachulke (and assorted other planned stuff). We hope to see you there! And here's a quick overview-reminder of October's Event Cornucopia! Event no.1: First off, a reminder that it's La Fête Fatale time again. They already spread their mad decadence in Hamburg for the first time on the 8th, and now it's home to Berlin again on Friday the 15th - at Goya this time around! Event no.2: Lorelei Vanora will be making another Pinky's Peepshow appearance at the Bassy Club on October 20th (a Wednesday, as always); this time around as a special guest of the Schönheitstanz studio here in Berlin. 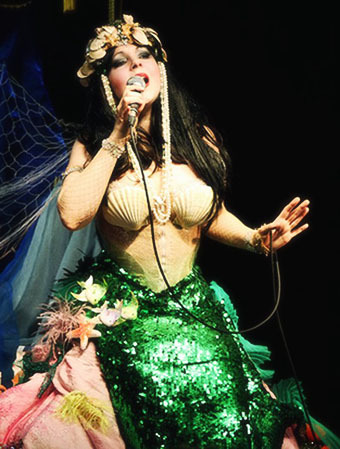 Lady Lou will be presenting another one of her Burlesque School Graduation events (Schönheitstanz Berlin Burlesque Night); with Betty Redcherry (newcomer), Lilly Tiger (performer), and Amber Vanilla (newcomer). Events no.3 + 4: Two days later, on Friday, October 22nd, you will have to choose between The Roaring Twenties and more burlesque. 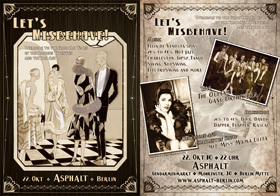 In the Roaring Twenties corner will be the premiere of the Let's Misbehave party (a Josephine Baker Tribute) at Asphalt. 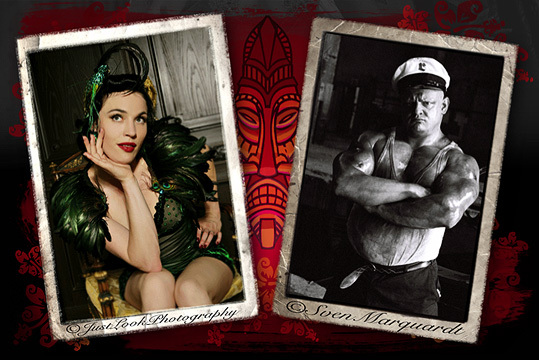 In the Burlesque corner will be another lovely Salon Kokett evening at CCCP. My personal choice for the evening will be The Roaring Twenties, since my alter ego, Lola la Voix will be making an appearance at Let's Misbehave. The fabulous and delightful Miss Erna Aloisia Pachulke will be the conférencière for the evening, and she's invited Lola la Voix to sing a couple of numbers with her! Event no. 5: A reminder not to forget that we'll be back at White Trash Fast Food again for a regular Dr. Sketchy's Anti Art School Berlin session on the afternoon of Saturday, October 23rd! Dr. Sketchy's #10 - our Halloween Special - starring Lady Lou (La Fête Fatale and Schönheitstanz) and Mitzi Metzger (La Fête Fatale)! Meet us there for lots of gruesome Halloween drawing fun!!! Event no. 6: And last but not least, Bohème Sauvage No.45, on October 30th, to finish up a fabulous month of glamorous Fall events!